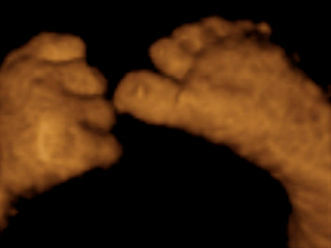 This image shows that even at this time your baby will be able to reach down and touch her toes (see the foot on the right and the hand on the left). Because there is less space your baby will no longer be able to place her feet on top of her head. Don’t be too concerned if your baby hasn’t engaged yet as this won’t have any bearing on the final delivery date. There are many reasons why your baby may not have engaged yet: the shape of your pelvis may mean that you need the pressure of the contractions to get the baby’s head to engage. Very athletic women tend to have babies who engage late because their taut muscles hold the baby in a different position. Second and subsequent babies tend to engage later because the tummy muscles are very loose, so the baby may move freely without feeling any need to get her head down. A big baby may not descend into the pelvis until the contractions start. Once the baby is head down and moves into the pelvis there are several positions she may adopt: six of the most common are shown here. The position is determined by where her back and occiput (the back of her head) are lying. The most usual position is LOL. If the baby is breech, the position is determined by how the bottom is lying. LOL (left occipito-lateral): the back and occiput are positioned on the left-hand side of the uterus at right angles to the spine. LOA (left occipito-anterior): the back and occiput are positioned nearer to the front of the uterus on the left-hand side. LOP (left occipito-posterior): the back and occiput are towards the spine on the left-hand side of the uterus. ROL (right occipito-lateral): the back and occiput are at right angles to the spine on the right-hand side of the uterus. ROA (right occipito-anterior): the back and occiput are towards the front of the uterus on the right-hand side. ROP (right occipito-posterior): the back and occiput are towards the spine on the right-hand side of the uterus.